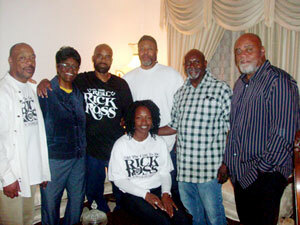 Freeway Ricky Ross is a free man. Free from a 20-year prison sentence he served for his role as a pawn, who unwittingly distributed crack cocaine for the CIA throughout the urban cities of America in the 1980s. He helped to spark an epidemic whose impact has spawned at least two generations of crack mothers, crack babies and crack wars. He first had a life sentence without the possibility of parole, which was reversed to 20 years on appeal. In his own words, he was either a victim or a villain, he once told the Final Call. But today, Ricky Ross serves as a savior. He took time during his celebration, and away from working on his yet unnamed TV reality show and theatrical film about his life, to share how during a one-on-one interview with Charlene Muhammad, Western Region Correspondent. They spoke at his mother's home on September 29. FINAL CALL (FC) – Thanks for inviting the Final Call to your homecoming celebration. How are you doing? How are you feeling? What are you thinking right now? RICKY ROSS (RR) – I'm doing super. I'm glad to be home. It's been a long journey but I never gave up the faith. I knew that one day I'd be back here, sitting in this house with my friends and family. It's wonderful. The greetings that I've been getting are overwhelming. I feel like a king. Yeah, I feel like a king. Health wise I'm pretty good. I've got a little cough right now, a little congestion in my chest, but other than that I feel like a 20-year-old. I'm a vegetarian. I don't eat any animal products, going on 18 years. FC: I've been calling you Freeway Ricky Ross and you haven't objected, so I see you still go by that name. There's been no change since you've been incarcerated? RR: No it hasn't. It's not the name that needed to change. It was the mindset. So my mindset has changed and that's the most important part. Once the mindset has changed, everything else can stay same but it's a different person. He may look the same. You may call him by the same name, but he's not the same person anymore. And basically that's what's happening with me my mindset has changed and I'm not the same person that I was 14 years ago. FC: Of course other than you being free from incarceration right now, are there any other changes, large or small that I can share with the readers? RR: Really, I've been from lockdown. I haven't been locked down these 14 years. Basically they had my body confined but my mind was running free. I did a lot of studying. The Minister [Louis Farrakhan] helped me out a lot. I watched tapes of the Minister. I think he's one of the most brilliant men living right now. I can't think of anybody else that I've run into, in all the books I've read, and everything, that I can put above him or on his level. Hands down, he's probably been one of the biggest helps to me changing my life. He talks all the time about us coming out of the old and coming into the new. He touched me one day I was watching a tape. This is when I had the life sentence and I've been trying to find that tape for years … he talked about being trapped in a situation and what he said is that the black man is trapped in America but if they grow they can overwhelm the system. And he said it was like a woman being pregnant. That if the baby continues to develop that the woman has to have this baby. There's nothing that she can do other than abort the baby to stop this baby from coming. When he said that, it touched me. I was sitting in the chapel. He's telling me to outgrow this prison system. So that hit me like a ton of bricks so I really started to grow. I'd been growing a little but not like I could have. Then he always tells us to go out our minds. Watch the music. Watch the TV that we listen to. Watch the books we read. When he told me that I cut out all the TV, cut out all the novels, all the fun and games. I stopped playing all the table games and I went strictly to studying. From that, right now, being on the streets these six months, it makes the world seem easy. It's like, I hear a lot of people complaining about the challenges and to me it's like baby's play, this is like taking candy from a baby. What are you guys talking about, it's tough out here? It's hard? I took those teachings and it just made life so straight and narrow. All you gotta do is just keep going right down that road and whatever you want you can pretty much have it. FC: I've interviewed many people who were incarcerated and I've found that no matter what they've been in for, the readjustment period is difficult. But because you studied Min. Farrakhan it helped you not only adjust but re-enter on a high plane? RR: Yeah. People ask me what is it like, and it's like just another day to me. I haven't had any problems. My thing right now is solving other peoples' problems. Right now I don't have nothing to complain about. I don't need anything. I don't want anything. I'm free. They can't hold nothing against me. Right now they could come and say we're going to put you back in jail and it wouldn't bother me. No problem. Whatever, I'm just free. It's like a feeling that's hard to explain. I'm in my own little world and the only thing that gets me off is helping other people, solving their problems, because I don't have any problems. I've been through it. I've done it, and now I'm just floating. Like the Minister said, he's working for the people and I can understand what he means. I feel what he's saying. Even though I'm not spiritually like that, but as far as wanting to help the people, I know exactly what he means. I understand that totally. FC: In terms of being free, and the CIA's role in the crack cocaine scandal, do you think that the government has really fully stepped up to its role in that? Or that the government owes you? I mean when you look at the news and you see Colonel Oliver North and others who were involved, it's like a where are they now sort of situation and the person who was actually the pawn, used, is the only person who actually paid the price? RR: I don't think that the government's going to step up. I don't think that they will ever fully admit to what actually took place. I mean it would be devastating to their reputation and to their character for them to step up and I was amazed that they said what they did say, that they knew that they were selling drugs but they didn't sanction it. To me that was like, man! I was still like kind of, did the government really do this? Were they really involved? Even with what was going on with what Gary (Webb, now-deceased San Jose Mercury News reporter who broke the story about Mr. Ross and the CIA's involvement) was saying, I still had doubts in mind. Then I see them step up and admit that they knew. I mean, you knew they were selling drugs, was like them saying they know that I'm selling drugs and don't do anything. I mean, you're the government, you don't know this guy is selling drugs and you don't stop it. Your job is to stop drugs, and you know that they're selling drugs and you even have the nerve to go and ask the attorney general to not prosecute you for not prosecuting them. That's deep, but knowing all of that, but I have to move forward. I know all this. I know what's happening. Basically they're not going to do anything and I'm not looking for them to give me anything. They gave me enough when they put me in prison. I took prison and turned it. They tried to punish me with prison but prison turned out to be maybe one of the best things that ever happened to me. I got to know people that I never would have known before. It gave me time to sit down and get to know myself, because I didn't know myself. You know when you're on the streets, you're running, you're moving. You never get to know who you are. FC: Where do you think you'd be now if you hadn't been incarcerated? RR: I could be dead. That's a possibility because I probably would have kept selling drugs. It's crazy because something has to wake you up and jail just happened to be what shook me and brought me to reality. In a lot of ways jail has been a blessing to me. Malcolm X said if they lock us up we'll learn how to read and write books. That was my situation. I read his book too and I learned from him. I just learned from all these different people that I was able to sit down and through their books I got to know them and through their books, their character became my character. Jail has been a blessing to me. FC: What have your learned from this ordeal, and was it an overall learning or did it come in stages, that can be passed on to young brothers or sisters who might now be in the game or just want to know about Ricky Ross? RR: I learned so many things, it might take us a lifetime to go through all of them, but I learned that we must hold onto our dreams. We can't let others crush our dreams. Too often we have goals that we set for ourselves, but people smash them. They tell you, you can't do it or you shouldn't do this or shouldn't do that, never looking to see if it's good or bad. I call them now dream busters. And a lot of times it's your own family. They tell you that it's certain things you can't do, if you want to start your own business, want to be a tennis player, play music, if it's something that's not the norm, and it's rampant in the Black community. We're so hard on our own. Go to school. Get an education. Get a job. We don't want to think outside the box, but I've learned it's ok to think outside the box. It's ok to be different. With me, I couldn't read and write in school, but I'm excellent with people. I've always been able to get people to follow me and do what I wanted them to do and I felt that somebody should have harnessed those skills and showed me how to work those skills at a young age and it would have turned my life in a whole different direction instead of me taking those skills and using them in the drug business. Reading is important … you must read and continue to educate yourself. We need to learn who we are. So many times we go through our lives and people are putting us down, telling us we're not going to be anything. I remember people used to tell me, boy, you ain't going to be nothing but a thug, and consciously that starts to set in and you take on that personality that they put in you, so you've got to guard your mind against people putting bad things in it, because you'll pick up that personality and start to live it out and you won't even know it. FC: Any regrets over time, since you were that 19-year-old young man that was turned onto this by someone who was actually supposed to be a mentor? RR: Well my life was an experiment. What I went through, now I know was for me to do what I got to do. I have a job that I have to do now and had I not went through that, I couldn't do the job that I'm fixing to do now. So when you say regrets, hmm. That's a tough one because to have a regret is to say that I can't do this job that I'm getting ready to do now for my people and that I wasn't willing to go through what I went through, but I was. I went through it. I did it and I'm sorry to see my people suffering the way they are now. I'm sorry to see what crack cocaine is doing to the people and all drugs, but to do this job that I gotta do, I don't have no regrets about it. I'm excited about it. I can hardly sleep. I'm ready to take it on full speed ahead. FC: What is that job? What are you getting ready to do? RR: I'll be speaking in juvenile halls, I'll be starting there, because those are the ones that people have forgotten about. I met guys in prison that told me they were in juvenile hall for nothing. Just kids who didn't have a mother, didn't have a father, nobody to come and get them. They told me about the way they were treated. The first thing I'm going to do is start reaching out to those kids, start helping them rebuild their lives, show them who they can be and after that, start going from neighborhood to neighborhood, one person at a time. It reminds me of the commercial where the little girl is on the beach and she's throwing starfish back into the ocean. And the guy walks up and says oh, you can't save them. There's too many. And she picks one up and she throws him in the ocean, and she says I just saved that one. That's going to be my approach, one at a time and I'm going to do everything that I can to save the babies. RR: You don't have to thank me. You can thank the Minister for waking me up and showing me what my mission was. And I guess you can thank Elijah Muhammad for waking him up.